We’re all muggles (or non-magic folk). My 11-year-old self would curse me for admitting it, but it’s the sad truth. However, there’s some good news. 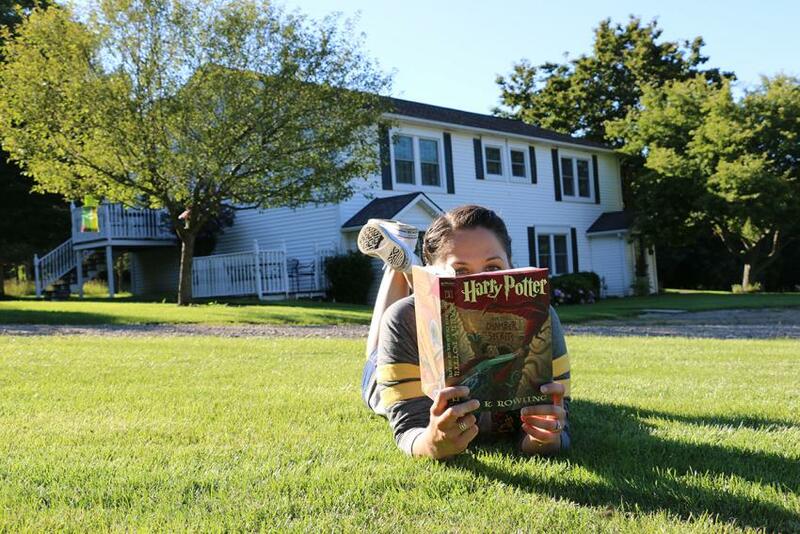 By turning the 4,224 pages of the Harry Potter series, we can all still experience magic in our lives. It’s a way to escape from ordinary routines and travel to a place full of charm casting, owl owning, potion brewing, broom flying, and of course, mischief managing. So, grab your trusty Nimbus 2000 broomstick and join us on a journey to celebrate the 20th anniversary of Harry Potter. 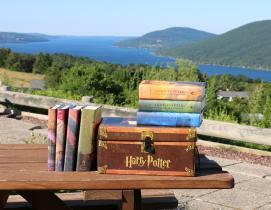 Let’s make our mundane responsibilities disappear and fly around the Finger Lakes to seven perfect locations to read all seven books, each containing enough spell-binding similarities to make J.K. Rowling proud. What better way to begin your reading adventure than a trip to your very own Hogwarts? With an impressive tower rivaling the peak of Gryffindor’s common room, Geneva’s Belhurst Castle is exactly what a budding witch or wizard could desire. The lobby even has a suit of armor to greet you (although it doesn’t move), while the lush grounds are a perfect place to embark on a quest to save the wizarding world. The only thing it lacks is a Room of Requirement—but fortunately, they already have everything you’ll need to stay, dine and drink during your visit. J.K. Rowling’s second novel introduces us to the Burrow, the home of Harry’s best pal Ron Weasley. 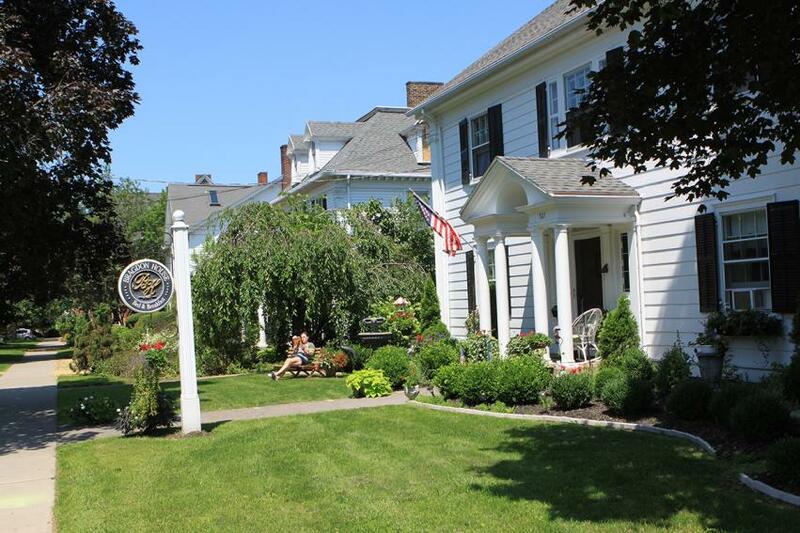 And a perfect muggle version of this cozy house happens to lie in the Bristol Hills of Canandaigua: The Filigree Inn, which touts itself as “a little B&B in the woods.” It’s a serene place full of home comforts, so you can easily unwind and read a chapter or two. Molly Weasley may not be there with her self-knitting needles and a freshly woven, monogrammed sweater, but the inn’s owner Connie will host you like any mother would. When reading Prisoner of Azkaban, you get treated to Harry’s initial (and illegal) visit to the fan-favorite Hogsmeade Village. 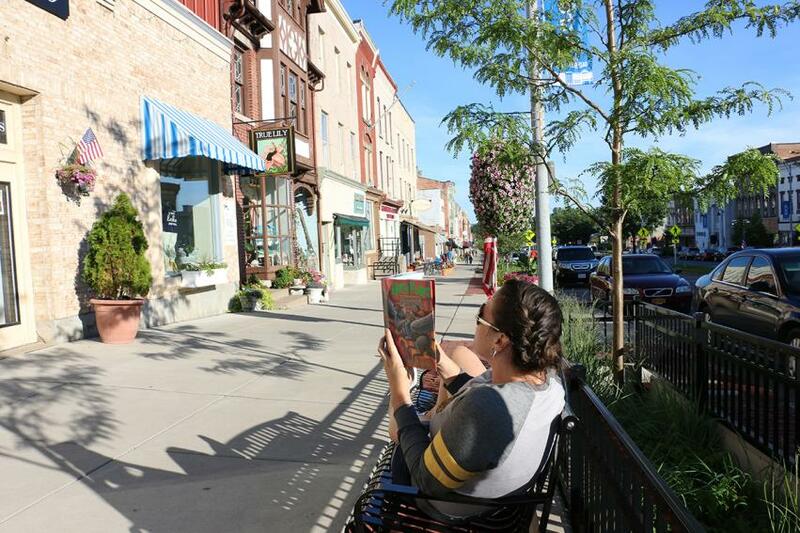 But instead of wishing you could walk its cobblestone streets, take a real-life stroll through historic Main Street Canandaigua with its variety of small businesses and local restaurants. There’s even a candy store rivaling the wizard-famous Honeydukes called Sweet Expressions. This popular shop specializes in fine chocolates (better than chocolate frogs) that are worthy of being sold on the Hogwarts Express snack trolley. The Triwizard Tournament, a celebrated contest between the world’s three largest wizarding schools, tests Harry’s bravery like never before. And one of the competition’s iconic challenges happens to take place at a lake—which works out well for a Finger Lakes tourism list. 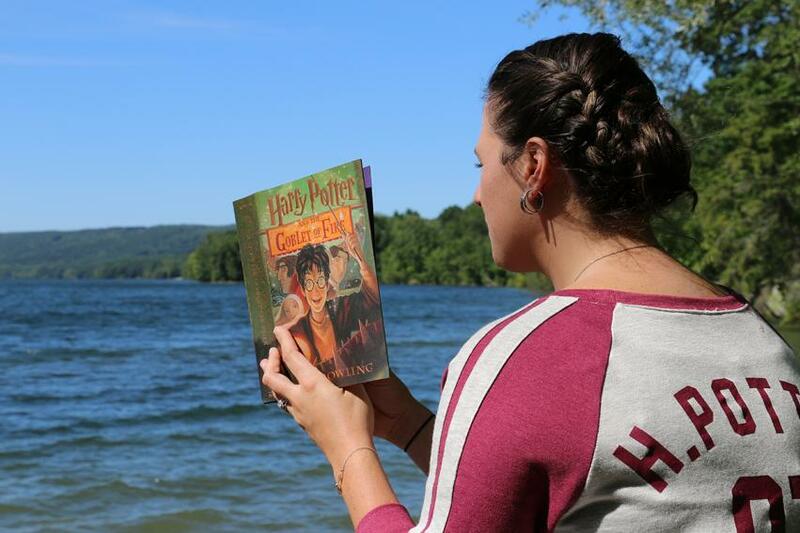 So, we’d recommend a prime book-reading spot at Hemlock-Canadice State Forest, which rests between two gorgeous lakes and is full of benches with scenic views. By the way, there’s no need to worry; the area is completely free of merpeople and grindylows. An eerie place that holds a spot in any Potter reader’s heart is Number 12, Grimmauld Place. This old mansion is the family home of Sirius Black, Harry’s godfather, and contains countless mysteries, traps and spells to scare anyone who enters without permission. 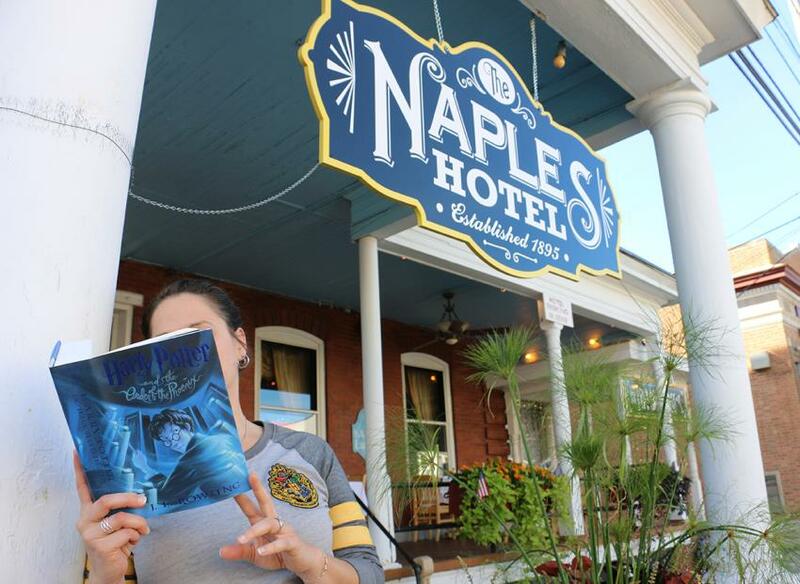 If you’re in the mood for a fright, check out the Naples Hotel which has been accommodating (and spooking) its guests since 1895. This historic hotel contains three stories of haunted rooms, each decorated with antique Victorian furniture. Plus, when you’re ready to take a break from spirits, you can fill yourself up with a butterbeer and read a few pages in its basement pub, the Tipping Glass (which is also a great spot for a secret Order meeting). The best way to have a fun-filled trip around the Finger Lakes is with your own version of Felix Felicis “Liquid Luck” potion: A bottle of delicious wine from Inspire Moore Winery. An award-winning winery with more than 12 premium wines, this vineyard has the liquid gold you’ll need to feel extra lucky. 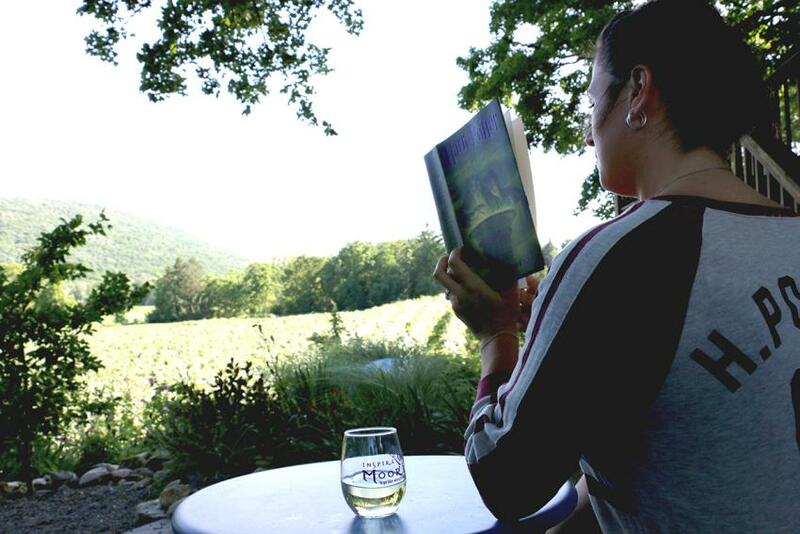 Stop by, kick your feet up, and enjoy yourself on the deck overlooking the magical vineyards and hills of the Naples Valley with a glass in one hand and Harry Potter in the other. And once you’re at maximum confidence, you can fly without a broomstick at the nearby Bristol Mountain Zip Line Canopy Tour—an aerial adventure through the Bristol Valley treetops. Arguably the darkest of the Harry Potter series, the Deathly Hallows contains one memorable retreat: Bill and Fleur’s lake cottage. This peaceful refuge helps Harry, Ron and Hermione gather themselves before their chaotic attempt to defeat He-Who-Must-Not-Be-Named. But what about a place to prepare for the completion of your own magical mission through the Finger Lakes? The Bragdon House in Geneva is an excellent water-side solution for weary travelers and tired minds—especially with its wine tours, homemade breakfast and eclectic décor. And once you’re done with all the books, you can celebrate your fairy-tale accomplishment over one last butterbeer at the Linden Social Club, located just around the corner. 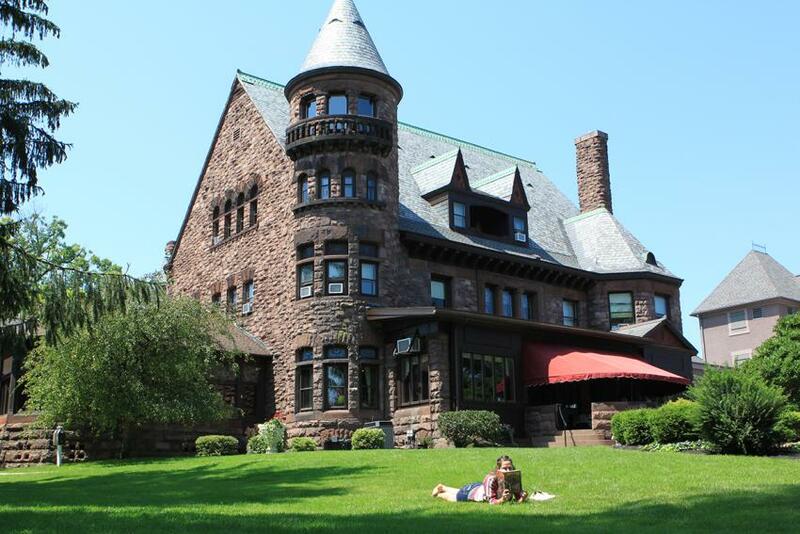 Now that you know the most enchanted spots in the Finger Lakes for delving into Harry Potter, it’s time to put on your robes, grab your wand, and go become an honorary witch or wizard! When your magical journey is finished, we’ll owe you a cauldron cake (or two). BONUS: During the 20 years since Harry Potter became famous to the muggle world, and 31 since he&apos;s been known in the wizarding one (Happy Birthday, Potter! ), HP has been creating friendships of all kinds. 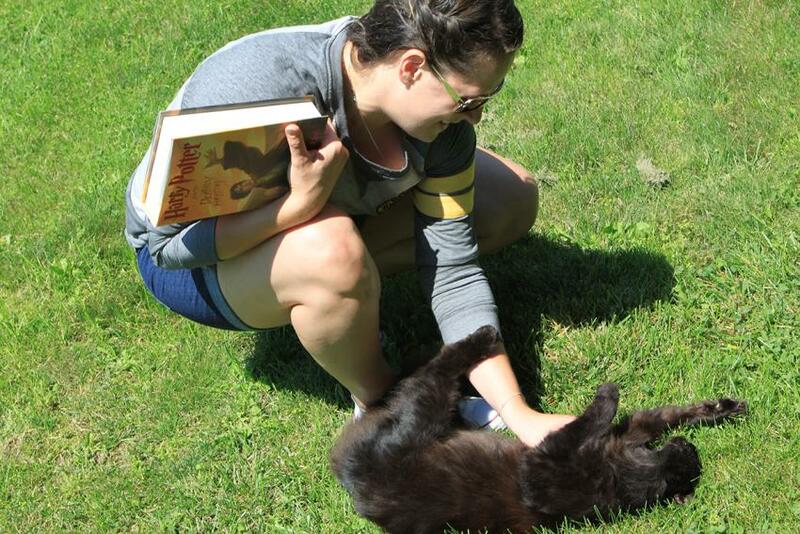 Just take a look at one of the friends I made on my wizarding adventure - this super-sweet resident of the Bragdon House!